We just came off of a huge match where our season could’ve changed for the worst. We came out big and didn’t let that happen. In our next match, the expectations were to come and crush this team. Always dangerous expectations. 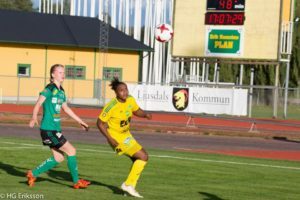 We played against Ornäs and if you have read how our game against them went last time, you can see why we were expected to win in a big way. So when we arrived at the pitch, we were stoked. After two games where us winning was just a hope, we wanted to take this game and run with it. But it just didn’t happen that way. We actually scored fairly early in the match. Great run by Vicke and a pass from me, boom. Goal. Then a great run from Ellika and a ball from Vicke and boom. Two goals. But then we just kinda didn’t do much after that. Well, let me be more clear. We had a gazillion opportunities. Thirteen on goal to be exact. I mean, that’s crazy! And they were brilliant chances too. But we just couldn’t find the back of the net after that. Our runs were great, our passes clean, just no more goals after that. We ended the game 2-0 and we were disappointed. You may be wondering why. And so were the coaches. But we as a team hold ourselves to a standard. We want to perform with passion and be proud of every game we play. This attitude can be amazing to some extent, but we forgot to be grateful for the win. Because we did win. We are still undefeated and we are still in first. Thus is life. Be grateful for the good. Stop worrying about the somewhat almost bad things. Love the moments you live.